On April 21st 2017, CSSD’s Unpayable Debt working group and the Oikos working group at New York University’s Institute for Public Knowledge hosted the “Narratives of Debt” conference. Organized by project co-directors Sarah Muir and Frances Negrón-Muntaner, the day-long event focused on the case of Puerto Rico’s debt crisis and explored debt’s relation to intimacy, kinship, sovereignty, and history in other contexts. The morning session featured scholar and artist panelists that focused on Puerto Rico’s debt crisis from multiple perspectives and media. In her presentation on “Puerto Rico’s American Dream,” Associate Professor of Latino and Caribbean Studies and Anthropology at Rutgers University Yarimar Bonilla discussed how the statehood movement has transformed in light of Puerto Rico’s debt and economic crises. Bonilla drew on her ethnographic work to detail the complexities of statehood claims in terms of race, citizenship, and sovereignty., arguing that the notion of statehood as the “pragmatic” status option relates to a broader relinquishment of the idea of postcolonial sovereignty. Journalist and documentary photographer Huascar Robles presented a captivating series of photographs that are part of his project “Los Silencios de Santurce.” The photographs document the local and palpable effects of the debt crisis and a controversial “urban revitalization” project (Law 212) that began in Santurce in 2002. The photographs reflect a rapidly changing urban environment and residents’ daily lives amid increasingly unequal urban spaces. Sarah Molinari, a doctoral student in Anthropology at the CUNY Graduate Center, discussed three circulating narratives of debt and Puerto Rico’s debt crisis: the scapegoating narrative of Puerto Rico’s fiscal irresponsibility; the narrative of debt incredulity; and the narrative of debt protest. Molinari argued that Puerto Rico’s debt is a key site of struggle and open to multiple interpretations with consequences for how debt politics unfold. Drawing from the recent BRIC exhibit “Ride or Die,” independent artist Miguel Luciano presented photographs of the exhibit’s vintage Schwinn bicycles, which are meant to invoke questions about the colonial relationship between Puerto Rico and the U.S. at the centennial mark of U.S. citizenship for Puerto Ricans. 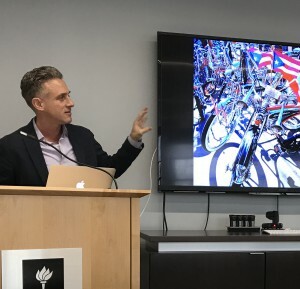 Luciano displayed different bikes, including the notable “Se Acabaron las Promesas” bike with the black Puerto Rican flag in the backdrop. This bike reflects a key question: how might PROMESA have provided a rupture with a long-held imagined stability of the ELA (Estado Libre Asociado)? The rich discussion following the morning session centered around the variety of resistance projects in Puerto Rico and the ambiguous new vocabularies that activists are conjuring, including among proponents of Puerto Rico’s citizen debt audit and art activism. Building on the intensive focus on the Puerto Rican debt crisis in the morning session, the afternoon panel titled “Debt and Intimacy” brought together an interdisciplinary group of scholars exploring narrations of debt across a range of time periods and cases. In his presentation titled “Commercial Affiliations” Associate Professor of Social and Cultural Analysis at NYU Michael Ralph made an intervention into current debates over race and the carceral state through a historical reflection on debt as an instrument for incarceration. In his talk, Ralph presented a fascinating history of how banking crisis in the erstwhile debtors’ haven of antebellum Kentucky (debtors from neighboring Virginia whose whereabouts were unknown were presumed “gone to Kentucky,” the audience learned) shifted investor attention from manufacturing to incarceration. As Ralph detailed, this banking crisis, coupled with legislative and court reforms, made incarceration of Kentucky’s white population a template for the 13th amendment in the postbellum era. In his presentation titled “Debtors’ Sanctuaries and the Sovereign Exception,” Associate Professor of Anthropology at the New School Gustav Peebles likewise animated current debates over deregulated tax havens and offshore finance by illuminating their historical roots in debtors’ sanctuaries. Cultivated by English sovereigns as a “popular exception” to their power, London was dotted with such sanctuaries between 1600 and 1850. As Peebles detailed, however, it was the increasing democratization of access to these exceptional spaces that eventually scared the capitalist class into moving them into what are now postcolonial territories such as the British Virgin Islands and Gibraltar. Far from “aberrant,” Peebles suggested that, then and now, these spaces of sovereign exception have structured the entire system of modern capitalism, but from the margins. Liv Yarrow, Professor of Classics at CUNY’s Brooklyn College, in her presentation titled “Private Debt and Public Foreign Policy, 51-50 BCE” took the audience back to the times of the Roman Empire to detail how two different kingdoms, one in Cyprus, and the other in what is now the Cappadocia region of Turkey, sought to negotiate their debts to private Romans. The affair was documented in the letters of the Roman Cicero, who was sent out from the capital to become a provincial governor. Initially intent on curbing the debt extraction practices in the area under his purview, Yarrow detailed how Cicero’s own entanglement in the web of debt relations that was the Roman Empire ultimately allowed him to reproduce its predatory logic. The story thus offered lessons on the perils of constituting society on the model of debt. In her presentation titled “Dreamworlds of Debt” Assistant Professor of English at CUNY’s Baruch College Amina El-Annan explored literary representations of debt in Confessions of a Shopaholic. Building on a quip, attributed to Ernst Bloch, that “the bourgeoisie dreams only of money,” El-Annan sought to (1) interrogate the relation between dreams and debt, and (2) probe the ways in which debt is imagined (i.e. in fiction). Exploring the paradox that the main character writes a column on responsible saving while falling into debt via her own uncontrolled consumption, El-Annan highlighted how the slippage between reality and fantasy occasioned by debt offers fertile ground for literary representations of contemporary society as imagined from a particular (bourgeois) vantage point. The panel was followed by a lively Q&A session that covered topics including the possibilities and limits of regulating offshore finance and interdisciplinary approaches to developing languages and methodologies for effectively theorizing and researching debt. These conversations will continue next academic year in events coordinated by the Unpayable Debt working group.